Thank you for buying receiver! It adopts an advanced wireless transmission scheme and has the advantages of a long transmission range, anti-interference and high mobility. It can receive AV signals at distant end and input them to a TV set to be displayed. It enables you to easily realize wireless sharing of HD AV data and enjoy untrammeled hi-fi visual effects. Attention: The receiver can't work with 2.4GHZ wireless digital signal device ,it's only work with 2.4GHZ wireless Analog Signal device . Please attation : the other accessories and power adaptor not include , please note it before you bid it . It adopts an advanced wireless transmission scheme and has the advantages of a long transmission range, anti-interference and high mobility. It can receive AV signals at distant end and input them to a TV set to be displayed. It enables you to easily realize wireless sharing of HD AV data and enjoy untrammeled hi-fi visual effects. 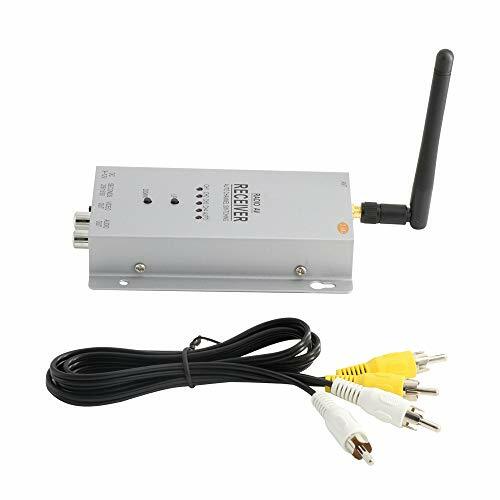 Please attation :The receiver can't work with 2.4GHZ wireless digital signal camera or transmitter ,it's only work with 2.4GHZ wireless Analog Signal camera or transmittter.The transmit distance is decided by the camera transmit power or transmitter transmit power . Package includes: 1 PCS Receiver 1 PCS AV cable(Cable length:122cm) 1 PCS Antenna 1PCS English manual ,the other accessories not include , please note it before you bid it . If you have any questions about this product by Gemgoo, contact us by completing and submitting the form below. If you are looking for a specif part number, please include it with your message.